Frank Boyden’s artistry moves easily from sculpture to ceramics to printmaking. 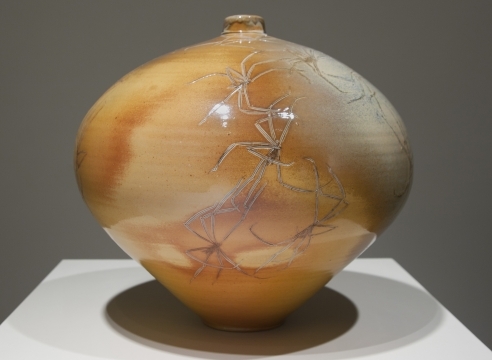 In this exhibition Boyden focuses on ceramic vessels that are wood fired, a technique he became interested in in the mid 1980s. These vessels start as a thrown pot made out of French or Italian porcelain. The artist then works animal and skeletal imagery into the surface pushing and pulling, giving each piece an organic and dimensional quality. They are not glazed but utilize the high firing of the anagama kiln to create color and texture. Boyden works the materials to his own advantage, accepting only a select few for their exceptional and arcane presence. A native Oregonian, Frank Boyden graduated from Yale in painting in 1968. He taught at the University of New Mexico in the late 60s where he became hooked on ceramics. He returned to the Oregon coast to live and founded the Sitka Center for Art and Ecology: a school for environmental studies. An internationally known artist, Boyden has exhibited his work in museums and galleries throughout the United States, Canada, and Europe. A pioneer in the field, internationally recognized ceramic artist Jun Kaneko is known for his monumental Dango sculptures. In all of his work, Kaneko expresses a unique sensibility toward color, pattern, and form. His sculptures fill a space with their energy and size, while they simultaneously encourage a close up tactile attraction. His design elements include colorful spirals, dots and zigzags set against backgrounds of solid color or layered in delicate washes. Jun Kaneko was born in 1942 in Nagoya, Japan. At the age of 21, he moved to the United States turning in the direction of ceramics. From his home and studio in Omaha, Nebraska, Kaneko presents his work across the country, and increasingly creates work for public spaces and for collections around the world. Locally, he recently completed a commission for the Beaverton City Library in Beaverton, Oregon. We are pleased to present the work of artist, Geoffrey Pagen. His unique approach to clay is like a painter to the canvas using sketching and doodling to create surface patterns upon wall mounted slabs. Influenced by nature and geometry he affects the surface with refined shapes and marks. His amazing range in glazing (many colors he developed himself) combines with the clay's organic texture. Here, Pagen's modern aesthetic combines with an ancient medium to create a distinctly simple yet beautiful body of work. Geoffrey Pagen received his MFA from the Rhode Island School of Design in 1975. He has been the Director of Ceramics at Reed College in Portland since 1979. His roster of commissions and public projects is impressive and extensive. 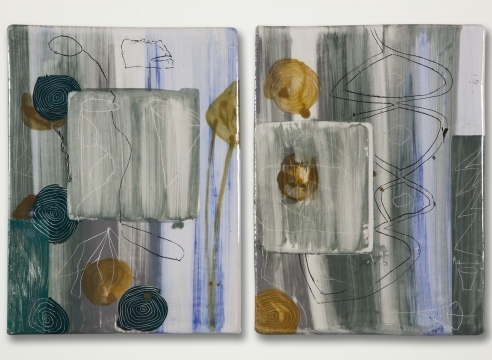 We are pleased to present the ceramic work of Don Reitz, well known for his ground-breaking salt glazing techniques. He studied clay in the 1950s at the University of Wisconsin where he also taught. By the 1960s he was exaggerating pottery elements and his work evolved into large forms. After a car accident in the early 1980s and a long recovery Reitz began to experiment with wood fire kilns while living in Arizona. His work took on a vitality and free style that signifies a playfulness that runs through his work today. His large scale, built-up forms are rugged in their presence while tenacious in spirit. Holding numerous honors and recognized internationally as a leader in ceramics, Don Reitz has exhibited and lectured worldwide.